GeoShred Pro Version 3.0, is an exciting update to the award-winning GeoShred musical instrument for iPad, iPhone and iPod touch NOW WITH AUv3 plugin support for devices running iOS 11.4 or greater. – Rewritten for AUv3 support. – Added support for cloud based file storage. GeoShred is an expressive musical instrument with a multi-touch performance surface, coupled with an advanced physical model of a guitar. A fusion of Wizdom Music’s Geo Synthesizer user interface (Jordan Rudess), and moForte’s powerful, modeled guitar and effects chain based on the next generation Physical Modeling research of Dr. Julius O. Smith III of Stanford/CCRMA. Add to that, incredible support for MIDI/MPE which makes GeoShred both a powerful synth and a formidable MIDI/MPE controller! Seamlessly move between fretless and diatonic modalities in a magical musical way using our isomorphic and diatonic playing surface and groundbreaking intelligent pitch rounding. GeoShred is NOT just another app. GeoShred is a powerful, musical instrument that offers a performance environment on a multi-touch surface unlike anything you’ve ever experienced. • A diatonic keyboard where every key on the screen is in the scale. •	Inter-App Audio and Audiobus support. •	Unique mono mode using intervals of multiple strings. •	Support for world scales and temperaments including Indian Ragas, Arabic and Balinese scales. GeoShred Pro Version 2.5, an exciting update to the award-winning GeoShred musical instrument for iPad, iPhone and iPod touch. 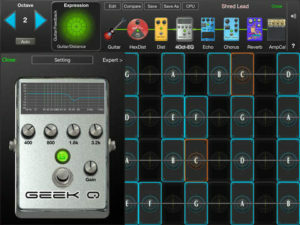 GeoShred, Winner of 2017 Electronic Musician Editor’s Choice Award as “one of the most innovative, groundbreaking products to emerge in the past twelve months”, has been enhanced with support for 3D touch (on iPhones that support 3D touch) control including MIDI/MPE Out, World Scales/Temperaments including Indian Ragas and Backing Tracks. CONGRATS JORDAN RUDESS!! GeoShred, Winner of a 2017 Electronic Musician Editor’s Choice Award as “one of the most innovative, groundbreaking products to emerge in the past twelve months”, has been enhanced with unprecedented MIDI/MPE I/O control, new effects, and additional model control parameters. GeoShred is highly expressive when controlling, and being controlled by, instruments that use the upcoming “MPE” MIDI specification (MIDI Polyphonic Expression). It’s both a powerful synth and a formidable iPad based MIDI/MPE controller! GeoShred is an expressive musical instrument with a multi-touch performance surface, coupled with an advanced physical model of a guitar. A fusion of Wizdom Music’s Geo Synthesizer user interface (Jordan Rudess), and moForte’s powerful, modeled guitar and effects chain based on the next generation Physical Modeling research of Dr. Julius O. Smith III of Stanford/CCRMA. With GeoShred’s physical modeling synthesis, you can achieve realistic guitar sounds that bend, stretch and manipulate the sound into endless possibilities. You can explore, edit and control the physics of a guitar model – including solid or hollow body, nylon or metal strings, pick position, harmonics and more. • Inter-App Audio and Audiobus support. • Unique mono mode using intervals of multiple strings. • Support for world scales and temperaments including Indian Ragas. 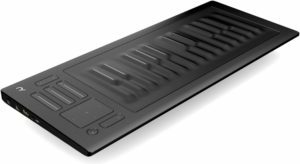 Here’s some exciting news for Seaboard RISE users! 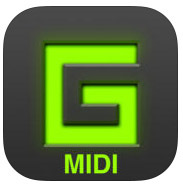 Wizdom Music’s award-winning GeoShred instrument for iPad is now fully compatible with the RISE. The factory presets all support 5D Touch and can also be modulated with the XY Pad and and the three Touch Faders which are mapped to GeoShred’s control surface. GeoShred, winner of a 2017 Electronic Musician Editor’s Choice Award as “one of the most innovative, groundbreaking products to emerge in the past twelve months”, has been enhanced with unprecedented MIDI/MPE I/O control, new effects, and additional model control parameters. GeoShred is highly expressive when being controlled by instruments like the RISE that use the “MPE” MIDI specification. It’s a fusion of Wizdom Music’s Geo Synthesizer user interface (Jordan Rudess), and moForte’s powerful, modeled guitar and effects chain based on the next generation Physical Modeling research of Dr. Julius O. Smith III of Stanford/CCRMA. Isomorphic interface alternative to a standard keyboard similar to a guitar. GeoShred is a powerful, musical instrument that offers a performance environment on a multi-touch surface unlike anything you’ve ever experienced. Physical modeling synthesis is back with a vengeance. GeoShred lets you create music using expressive physical modeling synthesis. You can achieve realistic guitar sounds, and also bend, stretch and manipulate the sound into endless possibilities. You can explore, edit and control the mechanics of a guitar model – solid or hollow body, nylon or metal strings, pick position, harmonics and much, much more! GeoShred’s unique, responsive user interface for performance and extensive sound design enables you to directly control dozens of model parameters and effects. With GeoShred, you have the power to make music that comes alive with expression, real controllable feedback, finger vibratos, note slides, power chords, auto-arpeggios and much, much more. – Small fixes for the help system. GeoShred is a fusion of Jordan Rudess’ Wizdom Music Geo Synthesizer’s user interface, and moForte’s powerful modeled guitar and effects chain. Geo Shred has been jointly developed by Wizdom Music and moForte Inc. It’s based on next generation Physical Modeling research of Dr. Julius O. Smith III of Stanford/CCRMA. GeoShred is a stand-alone musical instrument. MIDI MPE support coming in early 2016.